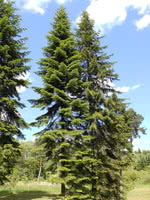 Siberian Fir is an evergreen tree best known for its strong aroma. 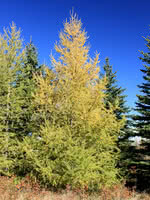 This tree's needles are popular for essential oils and aromatherapy. It also grows softwood that is used for furniture and wood pulp. This species is very cold hardy and shade tolerant. 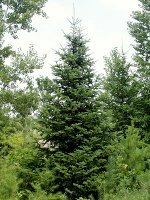 This species is bright green and conical shaped. Most interesting is its upright blue cones that fade into brown as they mature.